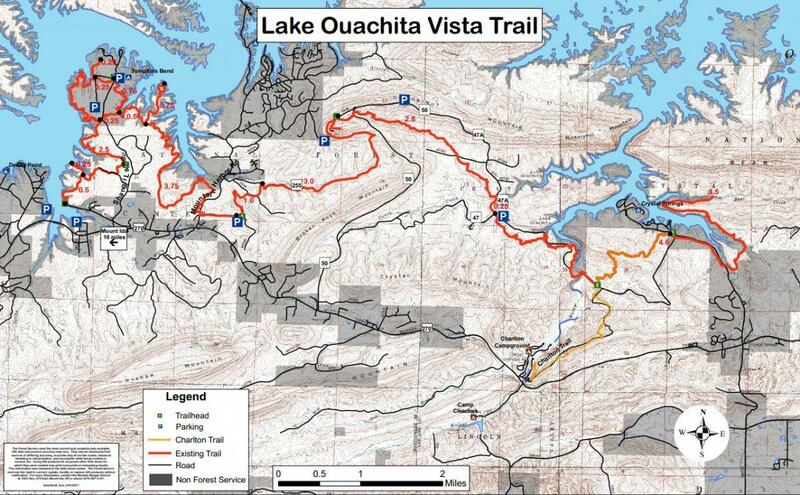 The trail is hard packed single track in pine and oak and follows the land contours adjacent to Lake Ouachita. Terrain is easy to moderate difficulty and is suitable for most abilities with short down hills, climbs, switch backs, and stream crossings. From Denby Point, ride about 5 miles to Tompkins Bend (camping and restaurant near by), cross the road and continue on the trail for about 3/4 mile to the Joplin trail intersection. If you miss this junction, you'll continue for about 1/4 mile back to the road and the Homestead Trailhead. On the route to Joplin, you'll pass an old quartz crystal mine at a creek crossing. You'll come out of the trail on Mountain Harbor Road just above the Joplin store and gas station on 270. Continue west for about a mile on 270 and you'll be back to the Tompkins Bend Road and your car. Review: Started at Denby, the first 3 miles to Tompkins has some steep, short climbs. Wife and I had to push a few of the climbs. The next 5 miles on the peninsula was much flatter with no real buster climbs. Sweet. You can make a loop out of that section. Never got a chance to ride more, but I think the bigger climbs are there to the east. Still, very nice flowy singletrack. Review: I've ridden the LOVIT from Denby to the top of Hickory Nut. It is such a sweet trail. From Denby to Joplin is mostly singletrack with some great flow and good views of the lake. I park at Denby, where there are now nice bathrooms, and for a quick ride take the road back from Joplin, which is only a few miles. Past Joplin is a dirt road climb, then down across Iron Creek (I think) which is a pretty technical area. The trail then tees into a double track. Take a right to continue to Hickory Nut Mtn. The climb up is pretty brutal, especially near the top where it's steep with lots of loose rock. I can't wait to ride the rest of this trail, especially the new stuff on Bear Mtn. Also, pair a ride on the LOVIT with with the Womble for a truly epic weekend (both are epics now). Review: LOViT=Lake Ouachita Vista Trail. This is written by a 72y/o long time ridder who hates pushin his bike up or down difficult areas. This a perfect trail!! for me. Beautiful, well maintained, well marked, continuous flowing hard packed single track. I can ride all of section 1 without putting a foot down but breathing hard after several granny gear climbs. Few rocks and roots. Lots of downhills to creeks followed by climbs. Great views of the lake. Great RV camping next to lake and trail. You will LOViT. Thanks to all responsible for this great trail. 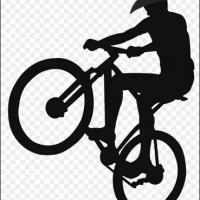 Lovit: Section 1 MTB Trail 5.00 out of 5 based on 3 ratings. 3 user reviews.